Want to copy anything from this site? Please read this first. Please note: Creequealley.com does not send out unsolicited email to anyone. Various creequealley.com email addresses have been forged by spammers and virus propagators which results in spam emails apparently being sent from this domain. Regrettably there is nothing I can do to stop it. As I get a large amount of "undelivered" email "returned" to me I am no longer accepting any mail at creequealley.com unless the subject heading contains the words Mamas and Papas. If you wish to email me please click here. This will automatically complete the subject heading for you. Thanks for being so understanding. "Their songs still remind me of being kid in the sixties when it seemed the summer lasted all year. Even now over 30 years later it just seems like yesterday. Ask questions, add your opinion or just say hello. See the musical history of each of The Mamas and The Papas. Hear a clip of Creeque Alley (385kb). and other Mamas and Papas songs. Buy Mamas and Papas music from Barnes and Noble. Visit the Official Cass Elliot web site. Denny Doherty's nearly true story of The Mamas & The Papas. Visitez ce site consacr� aux Mamas et Papas avec une bonne s�lection des clips sons et visuels. to the best Mamas and Papas sites on the web. This site looks cool with Comic Sans MS font. Download here. If you don't have it on your system the site displays in Arial. Creeque Alley was released in 1967 and tells the story of the formation of The Mamas and The Papas. This analysis is the result of much painstaking research, some guesswork and a lot of help from many people who have written to me to add some new spin to a line or two. It continues to evolve and I would welcome any comment so that I can add more detail. Please feel free to mail me with your comments. Thanks to all those who have written to me so far. Special thanks to Richard Campbell whose contributions have been especially helpful and whose web site at www.casselliot.com is the Official Cass Elliot page. So visit it now! John Phillips John Phillips had been playing in a folk band known as The Journeymen. The band, whose lineup included Scott McKenzie, played old folk standards but, like other similar bands at the time, were going nowhere. Mitchie is a reference to Phillips' wife Michelle. The Journeymen had often played at a coffeehouse called "the hungry i" which is where John met Michelle Gilliam. He discovered that she could sing, and fell in love with her almost instantly. He was 26, and she was just 17. John left his wife and children, and he and Michelle were married on December 31, 1962. Michelle had been doing modelling work but was later to become a singer with the Mamas and Papas. See this biog of Michelle Phillips. The Journeymen had split up by early 1964. Later that year John and Michelle formed The New Journeymen with Marshall Brickman (who later went on to co-write, with Woody Allen, the screenplays for Sleeper, Annie Hall and Manhattan; and won an Oscar for Best Original Screenplay for Annie Hall). Denny Doherty joined them to play at an engagement in Washington over New Year. By 1965 Phillips was getting restless and eager to try something new. Zal Yanovsky and Dennis Doherty had been playing together in a folk trio called The Halifax Three (more info). Halifax is a fishing port in Nova Scotia and may account for the fishing reference in this line but see message from Ian Maclure who thinks the fishing reference may be a bit deeper and also message from Roy Currie who challenges the reference to Halifax being a fishing port and also provides some interesting background information about Denny Doherty. 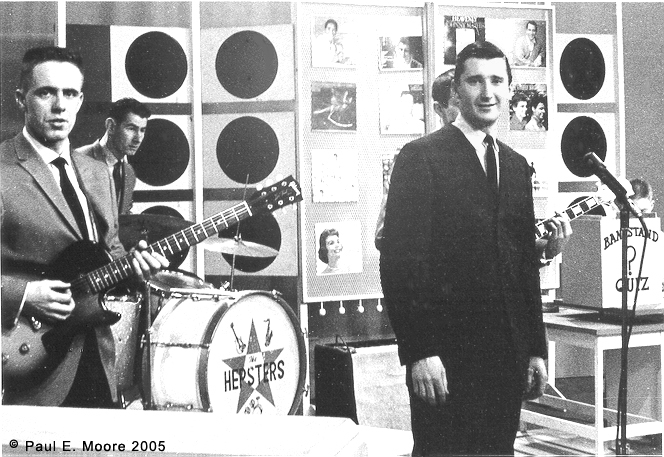 Denny Doherty (right) with his first band The Hepsters guesting on Birt's Bandstand 1961. Sebastian is John Sebastian (see www.johnbsebastian.com). At the time he was playing with The Even Dozen Jug Band and recorded with them under the name of John Benson - Benson being his middle name - because his father was already a famous harmonica player with the name John Sebastian (thanks to Ken Deifik for this information). 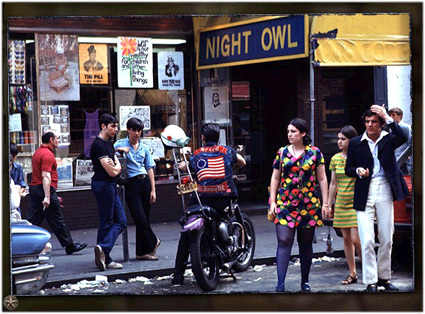 "They passed the hat" is a reference to the way some bands were paid in the coffee houses of the sixties. They literally passed around a hat or a basket and more or less took up a collection. Jim McGuinn (changed his name to Roger McGuinn in 1967) was enjoying success with the newly formed Byrds and Barry McGuire had a hit with Eve of Destruction - all this at a time when John Phillips was still trying to form a new band. At least that is what it has said on this web site since 1999 and no-one queried it until 2013. A correspondent has suggested that "McGuire does, of course, refer to Barry McGuire but since the song is about the scrappy origins of the scene that developed in LA in the mid-sixties it is far more likely McGuire's "rising higher" is a reference to the success he had in Randy Sparks New Christy Minstrel's than with P.F. Sloan's Eve of Destruction which is contemporaneous with the success of the Mamas and Papas. The song is vaguely chronological and a reference here to "Eve" would be anachronistic - more likely a reference to The Minstrels' big radio hit Green Green with McGuire singing lead. Randy Sparks is not mentioned in the song [Creeque Alley] but he was an important part of the early scene and commercially savvy, which attracted ambitious young folkies like Phillips, McGuinn, David Crosby, etc. (whether they were in his group, or competing groups like Les Baxter"s Balladeers)." This is also likely to be a reference to drugs, suggesting that before the Byrds became popular they were exploring drug use. There is plenty of evidence to suggest that drugs formed a significant part of the lives of many in the folk scene at the time bearing in mind that LSD was still legal in the US until 1966. Some correspondents have suggested that this line also refers to the Byrds record "Eight Miles High&uot; which ostensibly describes the band's first flight to Britain although many have interpreted the lyrics as a hidden drug allegory. However this record was not released until 1966 which is a little later in the chronology of Creeque Alley but would certainly have been released by the time Creeque Alley was written. Click here for more information about Eight Miles High. ♫ And no one"s getting fat except Mama Cass. Cass Elliot This is a reference to the fact that no-one was making any money out of playing folk music but Cass Elliot who, being on the large side, was not only "getting fat" but was also having success as a solo jazz singer in Washington DC. Cass Elliot was born Ellen Naomi Cohen in 1941. Her restaurateur father nicknamed her'Cass' after the Trojan princess, Cassandra (thanks to Gary Holwell for this information). She adopted the name Cass Elliot during her teens. The name Mama Cass evolved from her involvement with the Mamas and Papas. "Her father had a deli there [in New York]. I remember her as a little, chubby girl, with the stained apron on, behind the counter. [Laughs] We were sort of infamous in that area, and when she got to New York, she knew who we were, but we didn't know who she was. And she had met Denny, and Denny said, 'I know this girl that sings wonderfully. We should have her over and sing with her.' It happened to be that LSD was actually legal at the time. It wasn�t a banned drug or anything. We searched all over the Village and found some contemporary artist who had some and he gave it to us. We were about to take it that night, when the knock on the door came and Cass came in. So we all had it together the same night, for the first time, and I think that formed a bond between the four of us that we just never stopped singing. We just went on and on and on and on, until the trip wore off, which was about four years later." A reference to Dennis Doherty's singing abilities. "Let's go south" is a reference to leaving Canada for New York which is exactly what The Halifax Three did by way of Montreal, Toronto and then New York. A reference to ZalVs guitar playing abilities!! And no one's getting fat except Mama Cass. This is a rather oblique reference to Cass' on-again, off-again educational career. She was a very intelligent young woman (an IQ of 165) whose uncles were mostly doctors, and her parents planned for her to go to medical school. But she discovered show business during her last year in high school and dropped out two weeks before graduating. A few years later, with her career not exactly catching fire yet, she attended American University in Washington, D.C. (on the strength of her SAT scores and on a provisional basis since she didn't have a diploma). She did not reach her sophomore year by any means - by her own admission, she couldn't stay away from the drama department and kept hanging around there instead of concentrating on whatever it that was supposed to be her major - and she planned to continue at Goucher College (a female college near her home in Baltimore), not Swarthmore College in Pennsylvania (www.swarthmore.edu) , but apparently John Phillips couldn't make a rhyme out of "provisional freshman" and "Goucher." In any case, she dropped out again and went back to singing after a only few weeks. This refers to Cass's return to the Big Apple to perform and her probable means of transportation - she was pretty much broke at this point, as they all were. The "turnpike" is the New Jersey Turnpike which is the highway connecting Pennsylvania and Delaware to New York. Denny loved Cass as a friend. However, Cass was in love with Denny from the moment she had met him during their days with The Mugwumps (see next line). During the groups' visit to the Virgin Islands (see later) she discovered that Michelle had slept with Denny behind John's back! This caused much tension with the group. In fact Cass went to Michelle and said "you can have any man you want....why did you have to sleep with the one man I love?" For Denny's and Michelle's affair John wrote "I Saw Her Again" and made them sing it as a form of punishment. Listen to The Mugwumps recording of Everybody's Been Talkin'. ♫ John Sebastian and Zal Yanovsky formed The Lovin’ Spoonful. Before his death from a suspected heart attack on the 13th December 2002 Zal Yanovsky ran a successful restaurant in Kinsgton, Ontario called Chez Piggy. I’ve had correspondence from Brad Fallon who tells me quot;It is in a 150 year old grey limestone building and the walls are covered with memorabilia from his days with the Lovin ’ Spoonful and his earlier days from the Maritimes and with Denny. Seem to remember some great pictures of the Mamas and the Papas too from his own private collection." Sounds good to me. Michelle and John Phillips were already singing together in the New Journeymen. They were joined by Denny Doherty when Marshall Brickman left the group in 1965. They were doing OK in LA I guess! The Byrds had released Mr Tambourine Man which had elevated them from out-of-work ex-folkies to America♫s answer to the Beatles. It♫s also been suggested that this may also be a vague reference to riots in Los Angeles in 1965 when a lot of fires were set. ♫ And everybody's gettin' fat except Mama Cass. Cass Elliot had wanted to join the group but other members were concerned that her size would not promote the right image for the group and that her voice was considered too low to harmonize with Michelle's. This line seems to refer to the fact that McGuinn and McGuire were having more success than Cass. I have had the following suggestion from Aaron Stang: I think this reference to the Byrds implies they were beginning to get really popular (which reinforces that the first Byrds reference was a drug reference, before they got popular) And "everybody's getting fat" is a double entendre; in other words - everyone's doing great, getting popular, making money etc and Mama Cass is doing well also (because she's not getting fat). This is a reference to the Virgin Islands. The New Journeymen was over and they were sitting around one day and just wanted to take a vacation - Michelle, whose home was California, despised the coldness of New York. The story goes that they spun a globe and she, with her eyes closed, pointed to a spot and they decided to go wherever her finger landed - so the Virgin Islands it was. Dennis Honigs has written to me: "I heard an interview with Michelle, (I think, but it may have been Cass,) a long time ago in which she ... said the line was VMitchie wants to go to the CV (a note Cass couldn't reach and hence had to 'fake it')"
I've had an email from an ex-federal narcotics agent who has an interesting view about the line "broke, busted, disgusted, agents can't be trusted". He wishes to remain anonymous. Click here to read it and see what you think. This could be a reference to CassV inability to sing the arrangements that John wrote. As the story goes, Cass was walking down the street in the Virgin Islands when she was hit in the head by a pipe. (Someone threw it from a pile of junk they were going through.) Cass was knocked unconscious. When she awoke, it had affected her range and increased it by 2 or 3 notes. This increase in range allowed her to sing the arrangements that John wrote.Thus, the group's main excuse for keeping her out was no longer an issue. As further support for this claim, Cass once said that the arrangements were so high that at times she would become light-headed during the recording sessions. This suggests that Cass was singing at the top of her range. Furthermore, if you hear any of the Mamas and Papas live recordings, the songs are lowered considerably making the songs more comfortable to sing. Question: There was a story we heard about how a pipe fell on Cass in the Virgin Islands and changed her voice. Can you tell us about that? Michelle Phillips: Well, John has claimed that Cass actually got her upper range after the pipe fell on her head (laughs). She was walking past a construction site and a small lead pipe fell on her head. And when we were singing, later on that afternoon, she did seem to (laughs) have a much higher range. I don't know if it's really true or if there's any reason to believe this story, but it's a lie that we (laughs) told a long time if it's not true. quot;I happened to catch a rerun of Behind the Music with the Mamas and Papas on VH-1 and they discussed it with John, Michelle, and CassV sister. Basically, they all agreed that the pipe hitting Cass and knocking her out happened. But while John seemed sure that it changed her ability to get "that extra note", Cass' sister didn't seem to believe it at all. Michelle said that the story had been told so often she wasnVt sure of anything anymore but that, while she couldn't say that the bump on the head caused it, it did seem Cass was hitting notes afterward that she hadn't before." Cass Elliot knew that The New Journeymen were in the Virgin Islands. She missed Denny so much that, together with John's cousin Billy Throckmorton, she went down and joined them. This line suggests that the others knew she was coming but the truth is she just turned up. The group had an American Express card which was used to finance the trip to the Virgin Islands. It was actually owned by one of the other Journeymen and had been intended for Journeymen business expenses. Of course, no one was making any payments on it by this time, and the group's subsequenmt departure from the Islands was actually precipitated by an American Express representative finally confiscating the card when John went to the local Amex office to get a cash advance on it. Amex was eventually reimbursed with from the royalties from the songs written during the group's stay on the islands. These lines suggest that the group were starting to tire of their life in the Virgin Islands where, amongst other things, they had camped out on the beaches and generally acted in an unsociable way, possibly attracting the attention of the local police (the "heat"). Duffy's is the name of the boarding house owned by Hugh Duffy on Creeque Alley (pronounced Creaky Alley but actually spelt Creque's Alley - confusing eh? [Thanks to Brian Cornforth for pointing this out]) in Charlotte Amalie where some of the group's early songs were composed. Although Duffy - who now owns a restaurant in Puerto Rico called Chez Shack - was very encouraging and liked the group (giving out good vibrations, also of course a reference to the Beach Boys hit single of the same name) they were not making a living. "Well see, we went to the Virgin Islands the summer of '65, to rehearse and just put everything together. Cass and Denny and Michelle and I and the doctor who played guitar, and Peter Pilafian, who played violin. All these strange people. We took dogs with us and motorcycles and children. McKenzie, my daughter, went with us. She had her own tent on the beach. We were the last campers to arrive and we got the worst camping site. We called it Camp Torture. There was a mosquito bog right behind it. We went across the main island. We had this on St. John. Went across the main island, St. Thomas, and we got a job there, working at a club, Duffy�s - Duffy was a great help to us - singing, and we were trying to sing country pop, folk pop at that time, and we weren't quite sure how to do it or what to do. One day we heard "Turn! Turn! Turn!" - The Byrds - and they mentioned Jim McGuinn, Roger McGuinn now. Denny said, "We can do that. What's the big deal?" So we came back to the mainland and got a drive-away car and drove across the country to California and started recording, almost as soon as we got here." ♫ And California Dreaming is becoming a reality. Now back in good old New York City, paradise a fading memory, California was looking like the place to be. Many of the group's contemporaries had moved to the west and they decided to follow. They got a "U-Drive", a 1961 Caddillac which had to be delivered to San Fransisco. They had seven days to get there but made it in three. Of course this line is also a neat reference to "California Dreamin'", The Mamas and The Papas' first recording, which was released in October 1965 and was to go on to become a major hit and all time classic. Can you add anything to this interpretation? If so please email me. Anything I include in these pages will be acknowledged unless otherwise instructed. I'll also include links to home pages or any other relevant web sites if requested. creequealley.com is a non-profit making web site and has no commercial interest of any nature in The Mamas and The Papas or their music.